We didn’t want to do any serious engineering because we lack the financial resources to dedicate a staff team to search. We wanted something that works—an out-of-the-box solution. UPS Battery Center manufactures and sells sealed lead-acid batteries for Standby Power Systems, alarm systems, and emergency lighting devices. The company was started by Anton Khramov in 2008 and carries over 12,000 products. After migrating his online store to a new ecommerce platform, Anton realized the native search was ineffective and came to Swiftype for help. Ease and speed of implementation, customizable search interface, and in-depth analytics. Increase sales and conversions for your ecommerce store with powerful search. 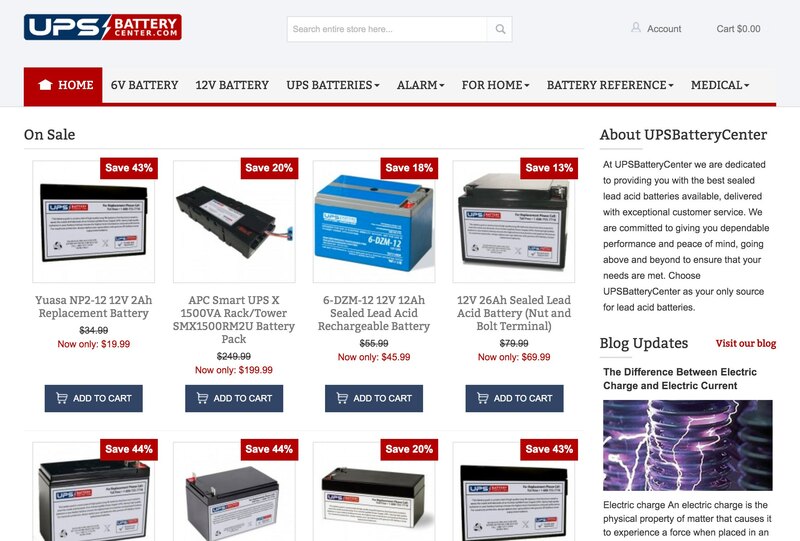 Customers were browsing UPS Battery Center for long periods of time and could not find the products they were looking for. They would often call, email, or live chat Anton and his team for help, and this became such a problem that they started bookmarking the most popular product pages so they could have the links readily accessible to share with customers. Anton tried every application, plug-in, and extension, but found that the would crash his site, which required time and resources to repair that he and his team did not have. Because Swiftype is a hosted solution, the installation process went smoothly for Anton and saved him time and in-house resources. Although provided with an installation guide and a dedicated Swiftype engineer, Anton says that his developer didn’t need any help and installed the solution in minutes. After installing Swiftype, Anton and his team saw the number of daily calls drop by a factor of ten, freeing them up to focus on high value clients and high quality customer service. In the first three months with Swiftype, UPS Battery Center saw orders increase by 140%, revenue increase by 125%, and overall conversion rates improve by 116%. Aside from seeing an increase in ecommerce sales and a decrease in support calls, Anton has been able to leverage Swiftype’s analytics to make key business decisions. Each week, Anton looks at top queries to see the most popular products that he might need to order more of, as well as the top queries that aren’t returning results to see where customers are not finding what they need. From there, he is able to customize the results for those queries or change his inventory so that users never hit dead ends on his website. After switching to Shopify and struggling with slow search plug-ins on their store, BulbAmerica switched to Swiftype.